Dreaming of a key can mean many different things. Often times, keys are symbols for unlocking some sort of hidden knowledge. Keys can appear in our dreams in many different ways - the key to a gate in a dream does not always mean the same thing as dreaming of the keys of a car. What Does it Mean to Dream of Keys? If you dream of a key needed to open a book or to access a library or even a box of letters, these keys can be a symbol for hidden knowledge. Often times, this is a message from our own higher selves to learn how to use our intuition and tap into our own deep inner wisdom. Seeing keys in a dream can also mean that you have been keeping a secret from someone. There may be some details that you are hiding are not fully telling others. Keys can also indicate you may be locking away a secret life. If you feel like you are living a double life or you act differently depending on who is around, it could mean you are keeping some aspect of yourself hidden from others. We sometimes dream of keys as symbols of power. For example, the key to a jail cell could mean that some part of you is feeling controlled or oppressed by others. You may feel like you are being punished by others. Having the keys to a car can mean that you are feeling in control about a situation. It can be a reminder from your inner self that you have the ability to take control of your life at any moment. The power is in your hands. Sometimes keys in dreams can mean we are looking for ways to solve a problem. You may be looking for methods to find a solution to something that is bothering you, or you need to find a way to overcome challenges and obstacles in your current life. Sometimes keys can mean a desire to know the full truth about a situation. You may want to understand why something is the way it is, or you may want to uncover the full meaning of a situation. You may be concerned others are not being fully truthful with you, or that they may be hiding something from you. There are many other ways keys may appear in our dreams. To dream of finding keys may mean you are looking for a solution to a problem or you are looking to find a way to access new knowledge or information. To dream of something being locked away can mean you feel it is very difficult to reach your goals. There may obstacles between you and your success. A Ring of Rusty Old Keys: This could mean that there is something you have forgotten or neglected, and this is why you are experiencing difficulties in something in your current life. It could also be a reminder of some sort of problem in the past and the resurfacing of feelings you need to release. Being Locked Up: If you feel you are trapped and need keys to escape, you may be feeling like you are stuck in a situation in your waking life. You could be locked up in a jail cell in the dream, or you may find yourself trapped inside a house with no keys that are open. See meaning of being trapped in a dream. The Keys to a House: If you dream about the keys of a house, it can be helpful to understand the symbolism of the house dream meaning. Often times this means there may be a part of your own self that you are hiding or wanting to keep hidden from others. This can also sometimes manifest as a wish type of dream, in which you are hoping to find a suitable house in your current life. Giant Keys: To dream of gigantic keys could mean you are seeking opportunities. You may be wishing for something in your real life. You may also want to understand something in greater depth. Losing Your Keys: This often relates to responsibilities. Is there something in your life that makes you feel as if you must exercise care and caution? Are you overwhelmed by the demands of a job or activity you are doing in your waking life? Losing your keys in a dream can also mean that you have lost trust and faith in something or someone. You may no longer feel as if this person is loyal or that you cannot rely on a specific outcome. Did you have a dream about keys? 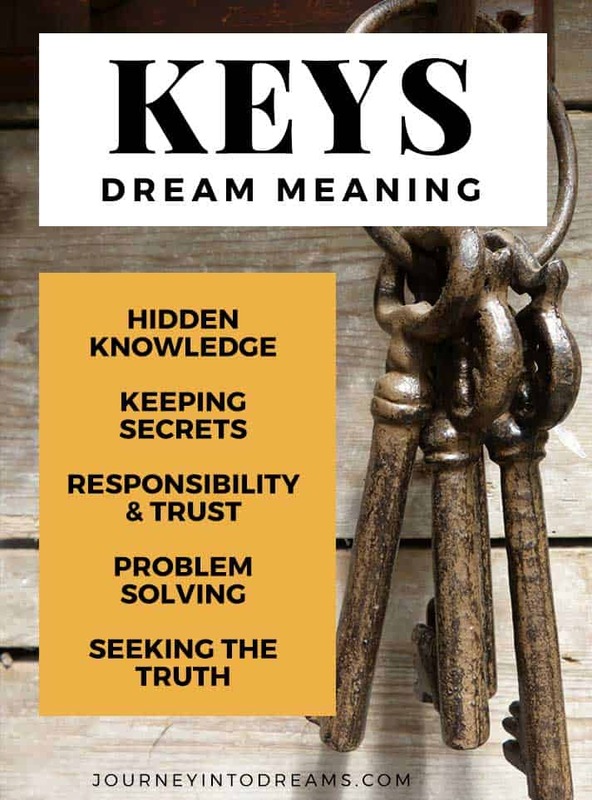 Share your dreams about keys you would like to interpret and understand the meaning of in the comments section below!